Moreland Food Gardens Network: The Lemon Tree Project Planting Days! The Lemon Tree Project Planting Days! 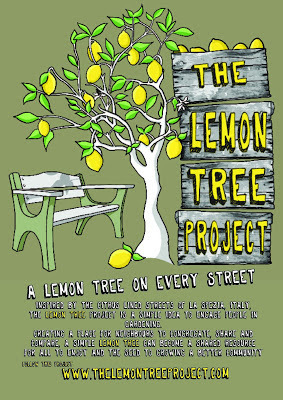 Come along to a Lemon Tree Project planting day in Feb as part of the Sustainable Living Festival. These Lemon Tree Project events are being run by the founding Hume Environmental Champion Team and North Metro Monkey Rangers as part of the Girl Guides Australia Environmental Projects whom are teamed up with GSUSA and sponsored by Alcoa. The Lemon Tree Project is about creating a place for neighbours to congregate and share, so come down and join in the fun and help our communities. Two Girl Guide halls will have Orchards planted in the surrounding parklands and one neighbourhood street in Craigieburn. North Metro Monkey Rangers as members of The Lemon Tree Project have a campaign to get 100 communal Lemon / Fruit Trees in the ground by Autumn. On the days we are taking pledges from locals whom wish to plant fruit trees in their front yards to share with neighbours. Lemon trees will be available for $10 along with a pledge – our aim is to plot the lemon trees with an app which will be created later in the year. A gold coin donation BBQ will start at each of the sites at 11:30pm.